Lines like this, to buy bread in Santa Clara, have been seen throughout the island. 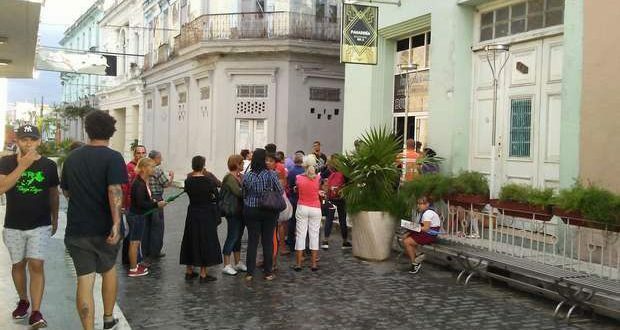 Because they have more inhabitants, the longest lines are those in Havana. And not only to buy bread, also eggs and pork, among other products with shortages and with higher and higher prices. Image by Laura Rodríguez taken from Cubanet. Ivan Garcia, 20 December 2018 — Even in the best stage of Fidel Castro’s Revolution there was always something missing. In the 1980s, thanks to the blank check circulating from Moscow, the ration book distributed half a pound of beef per person, drinking a glass of milk was not a luxury and jams, juices and wines and other products from the Soviet Union, Bulgaria, Albania and other socialist countries of Eastern Europe were sold on shelves in the parallel market. The daily life of the people was tied to the olive-green State up to levels that bordered on delirium. A house on the beach, a black-and-white television or a simple alarm clock was bought as a bonus for an outstanding worker awarded by the union. Celebrating Christmas, listening to American music or wearing cowboy-style Levi’s were symptoms of ideological diversionism. The regime was never able to manage an efficient transport service on the iland, or sell quality footwear or build with good taste. There have been stages worse than others. But it always returned to the starting point: inefficiency, low harvests, shortage of food and long lines to acquire them. Castroist socialism was noted for being more political than economic. Now, not having generous sponsors, such as the former USSR and the Venezuelan wallet of Hugo Chávez, Cubans live in a perpetual economic crisis. In a portico near the Plaza Roja of la Víbora, south of Havana, José Antonio expects to earn twenty or thirty Cuban pesos from the sale of objects found in the trash. Breathe a little fresh air, from a dirty backpack he takes out a plastic bottle and a stew of distilled alcohol, the drink of the forgotten. For many in Cuba, including José Antonio, the Special Period has never ended. And again ordinary Cubans will not be able to celebrate Christmas Eve, Christmas and the arrival of a New Year (which in 2019 coincides with the 60th anniversary of the Castro Revolution) as they wish, with enough money and food to enjoy it with family and friends.